Green Collserola I is a 24 km ride that takes about two hours to complete. Starting at the Plaça Karl Marx, you will head up to Cami Antic de Sant Llàtzer. Take the next right turn up the dirt road to Can Masdeu past the city’s old leper hospital. The path will then cross the Carretera del Cementiri de Collserola where you will veer left towards another junction beneath a power line pole. Turn right and head back down to Carretera del Cementiri and towards the path for Can Catà. Head back the way you came or ride the train back down. Green Collserola II starts at the Sant Cugat del Vallès station and heads towards the monastery of Sant Cugat. Follow the cycling lanes on Francesc Macià, and take a right on Av. de les Corts Catalans. From this track, you can catch a glimpse of Montserrat if it’s a clear day. You can follow this all the way to the Reserva Natural de la Font Groga from which it will be all downhill. Tibidabo is a nearly 7 km ride starting at the Tibidabo Fairground, from which you can get all the way to Vallviderera and then descend to Molins de Rei. This is a scarcely traveled part of the mountain, making it an ideal bike path and a ride you don’t want to miss. 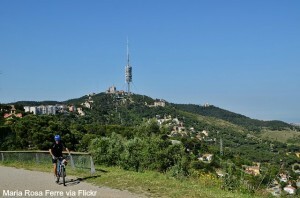 Half-Day Bike Tours from Barcelona are a great way to explore the Sierra de Collserola. Being so close to the city you can literally ride all the way to the mountains and back in less than a day. With the knowledge of the guide, you won’t have to worry about getting lost or taking yourself on a ride that is beyond your fitness level. When staying at a beautiful Barcelona short term rental you can bring your bike along if you’re planning on multiple rides. These spacious flats make for easy storage and will save you the expense of having to rent while here, as well as giving you a great mode of transportation around Barcelona.